The Easter edition of the newsletter is available to download - Happy Easter! Sunflower Seeds issue 51 is now ready for doanload with all the latest news from Casa Valentin. Multiply Smile donations - briefly! Read more about Multiply Smile donations - briefly! Download the newsletter below for the latest news from Casa Valentin. Our previous provider for secure online donations, Charity Choice, have ceased that service so we have switched to BT MyDonate - this is still a service which is provided for free, so every penny donated goes straight to Sunflower Fellowship. It's quick and simple, the link graphic is at the side of each page on the website. BT are a trusted, reputable company, who provide this service as part of their own charity work so that they don't have to charge us fees for their service - supporters know they are donating over a secure service, and the money arrives safe and sound in our bank account ready for use at Casa Valentin. Spread the word! 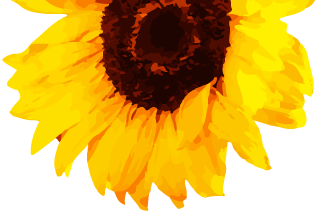 Sunflower Seeds number 49 - April 2018 is now available for download below. As many of you will know, Adrian was injured in a domestic gardening incident (involving a chainsaw!) at the end of last summer. He continue's recovering really well and both fingers have healed quite well. He cannot play the guitar but does well on the keyboard. Anyone who has met Adrian will be unsurprised that he doesn't allow this to slow him down in the least, his enthusiasm and hunger to serve God are unaffected. Thank you all for your concern and prayers, please continue to pray for his recovery. In March, Adrian & Gabriella (who run Casa Valentin in Romania) came over to visit, and particularly to join us for our Sunflower Fellowship Celebration meeting. Twenty-four supporters braved the snowy conditions to make it to the Pilgrim's Hatch Mission for the meeting. Adrian and Gabriela showed some pictures on-screen and talked about their current work at Casa Valentin, including the safe arrival of all your shoe boxes. They also answered questions from the floor, and after, everyone enjoyed seasonal cream teas! Click 'read more' link below to see more photos. Thnk you to all who sent shoeboxes of presents for Christmas. 312 were successfully delivered to the children of school ages, covering 4 villages (Cataloi, Frecatzei, Posta and Telitza) plus 41 children who attend Adrian and Gabriela's other Day Centre in the County Town of Tulcea. Here are pictures of the happy children receiving their boxes - for many this will have been the only presents they received, so a massive thank you for all you have done for them, your continued support is greatly appreciated. Click 'read more' link below to see more photos. Help us play our part in recycling by letting us have your used ink cartridges. We cannot, however, take in Epson or Kodak cartridges or any compatibles - only originals. Each empty cartridge we return can raise £1 towards our funds. Sorry but we are not able to recycle toner cassettes. You can get the cartridges to us - or have freepost envelopes delivered direct to you which can fill and return and we will receive the funds.